Next time you're in Courthouse Square, notice the grassy area in the center is a cross. That's a nod to the old historic courthouse which was there (albeit with a larger footprint) before it was wrecked by the 1906 earthquake. It was a such a pretty building; it looked like an ornate Victorian music box. And it was quite a popular attraction in the years around turn-of-the-century - there are more postcards and snapshots of it than any other place in Santa Rosa. But in 1883 Sonoma county was so bitterly divided over constructing it that Petaluma wanted to break away to form a new county rather than have anything to do with the project. This happened at the start of Santa Rosa's boom times, although the big changes really didn't begin until the following year. Still, there was plenty for them to cheer about in 1883. There was a new city hall/library/firehouse, new homes and commercial buildings were going up all over town and property values were up almost 25 percent from the previous year. T. J. Ludwig, Santa Rosa's busiest contractor, had a weekly payroll equivalent to about a quarter million dollars today, plus he also owned a lumber yard and co-owned a planing mill. Then in November the Colton trial began (see link above) and the town found itself awash in big-spending lawyers. With all that progress in the air it's not too surprising the Board of Supervisors brought up the issue of a new county courthouse. The existing one dated to 1855 and was so poorly constructed the Supervisors initially refused to pay the contractor. The roof leaked, the walls cracked; ongoing repairs and do-overs tripled the original cost. Grand juries repeatedly denounced it as unsafe as well as a “public nuisance.” Lacking any dispute that a replacement was needed, the only issues were how to pay for it - and more critically, where to put it. Rebuilding on the existing location was never considered - another old complaint was that the space was too cramped. But there were not a lot of other options in 1883; the core town was already pretty built out by then, with the few remaining large parcels being east of E street or west of the railroad tracks. Only the big, empty plaza smack in the heart of the downtown remained. Santa Rosa had a love/hate relationship with its public square going back to the Civil War. It was simply a small park criss-crossed by footpaths; there was originally a small grove of heritage oaks on the east side but by 1883 photos shows a haphazard mix of spindly trees, evergreens, pampas grass and century plants. Two years earlier a stray pig rooted up the grass and the newspaper bemoaned the soil was so sun-baked it would be best to plow it up and pray the place wouldn’t look so craptastic next season. 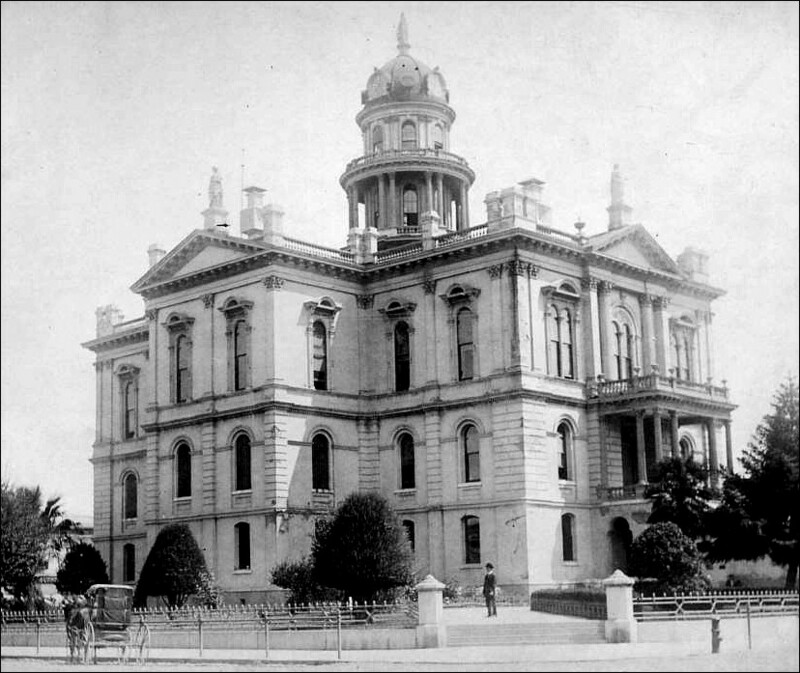 At that first 1883 meeting of the Board, it was Supervisor George Allen of Petaluma who suggested putting a new courthouse on the plaza. The Petaluma Courier agreed it was a good idea, but said so without conviction. Santa Rosa's daily and weekly Democrat insisted it shouldn't be done. "Our neighbor does not understand the situation," wrote editor Linthicum. * "However much the City Trustees might desire to donate the plaza for that purpose, it could not be done. The plaza was deeded to the people of Sonoma county for a public plaza." As we'll learn it a moment, that issue was very much in question. Then at the Board meeting three weeks later, Supervisor Allen made a new proposal: Build the new courthouse in Petaluma and the town will donate Hill Plaza Park (now called Penry Park) for the purpose - and locals will throw in $100,000 to sweeten the deal. Which, of course, would also make Petaluma the Sonoma county seat. Everyone's positions flipped faster than a politician being handed a blank check. The Petaluma paper discovered a new urgency in having the courthouse built; the Santa Rosa paper decided "...the new Court House question has developed one fact, we think, pretty clearly, and that is that the plaza is the only place for a site upon which there can be anything like a substantial agreement." The Santa Rosa City Council rushed through a resolution that the county could build it on the plaza or any other place it wanted as long as it was in the town. And so began another bout in the Santa Rosa and Petaluma newspaper prizefight. As editorial MMA fighters Cassiday and Thompson were not available to slug it out this time, it was mainly just sparring with peppery insults and snark. The Democrat sneered "the people of Sonoma county will never vote to place the county seat in an off corner of the county," even though Petaluma offered a bribe and would "smile a Santa Rosa man out of his boots." Since Petaluma's park is on a small hill, a correspondent wrote the Democrat that a step ladder would be needed to reach a courthouse there. The Courier snapped back, "When the gentleman was here he tried to walk up the five steps from Main street to the plaza above the wall, but his legs were so infernally tired that he couldn't make the landing." Round one goes to the Democrat for a parody written in backwoods dialect. "Petalumar" stank and looked "as if Natur had spewed up the town site sumtime when mity sick at the stumick, and then tried to hide it by scratchin a litter of houses on it." I suspect most folks at the time thought it was all big talk and the topic would soon be forgotten. What was the urgency, anyway? There was nothing actually wrong with the existing courthouse and jail (at least, at that moment), aside from its long-standing problems. But come Spring and the Board of Supervisors were still pushing ahead and not considering any location other than the plaza. They solicited architectural bids with a $80 thousand budget - more money than the county had ever spent on a project. It was around this time that factions in Petaluma began circulating petitions. It's not clear if there were two separate petitions, but the issues at hand were both a vote to move the county seat to Petaluma and to split Sonoma county in half. This was the third time such attempts was made; in 1870 there was a similar call to make Petaluma the county seat for a new county and there was an 1861 effort to move the Sonoma county seat to Petaluma (that same year there was also a proposal to make it part of Marin). Moving the county seat could be done by a two-thirds popular vote (which is how Santa Rosa snatched it away from Sonoma City, remember) but creating a new county was a far more difficult legal and political maneuver; a split could only be done by the state legislature. It would also entail Brexit-like negotiations to untangle the new county from the old in terms of deeds and other legal records, bond debt and laws. Quixotic or no, both Santa Rosa and Petaluma took the petition seriously. "The petition has been circulated and runners sent out over the county to build up a prejudice against Santa Rosa," complained the Democrat. Santa Rosa had an agent in Healdsburg (and probably other towns) discouraging voters from signing it - there was even a story that he was paying signers to remove their name, although that may be apocryphal. ...would it not be well for the Supervisors to ascertain to a certainty about the title before they expend the first installment of $80,000. The claimants to the plaza would, as a matter of course, remain very quiet while a big, fine building was going up on their property - or, in other words, upon property they claim will revert to them when used for any purpose other than that of a plaza. Of course, we very much desire to have the Court House down here, but if we can't get it Santa Rosa will do pretty well, but we protest against building even an $80,000 house on somebody's land, who will want it just as soon as the last coat of paint is put on. The paper was referring to events fifteen years earlier. Gentle Reader surely recalls when Santa Rosa was founded back in 1853 that half of the new town belonged to Hoen & Co. (Barney Hoen, Feodore Hahman and J. H. Hartman) and the other half was Julio Carrillo's. The acre composing the east side of the plaza was donated by the company with Carrillo giving the western acre. Then in 1868 Julio found himself destitute and unable to feed his large family (12 kids!) and sold his side of the plaza for $300, saying he hadn't formally granted a deed to the county or city or anyone else back in the day. The three local men who made the deal with him tried twice to establish their claim to the plaza by constructing a shanty, only to see the shacks quickly knocked down. The city then passed a new ordinance making it illegal to put up any sort building in the plaza - a law which was still in effect in 1883, as far as I can tell. All those events are hashed out here in "COURTHOUSE SQUARE FOR SALE, CHEAP." WAS IT LEGAL? Besides Julio's buyers, everything about the title to the plaza land was unclear. Had the founders given it to the town, or the "people of Sonoma," viz. the county? Apparently Julio was right in saying there was no deed or other paperwork. And even if that question could be waived, it still had been gifted with the clear intent of it remaining a park - founders Hahman and Hoen had already objected to the courthouse plan. In agreement, District Attorney Thomas Geary opined "the county had no more right to put a building there than they had on the county road." WAS THERE FUNDING? The Board of Supervisors had no serious discussions on how to pay for the expensive new courthouse aside from the expectation they could get around $30 thousand for the parcel with the existing courthouse/jail and create a special tax levy to collect the rest. The best offer came in on the low end: $26,000. (The bidder was Matt Doyle and his partner, who used the land to build the Exchange Bank, which is at the same location today.) Because of this shortfall, the Supervisors raised county property taxes by 21 percent for two years. WOULD PETALUMA GIVE UP? It was never revealed who was behind the Petaluma petitions, but it was clear they had money and were persistent. Should the Supervisors not allow the vote, the Democrat voiced fears they would sue the county, and the matter would "undoubtedly go to the Supreme Court, [and] it will be several years before it is decided...Suit will also be brought in the name of the people, by parties in Petaluma, to test the validity of the title to the Plaza, and it seems us though there will be an endless amount of litigation brought about by those who oppose the erection of a new Court House." WILL THE PROJECT BE ABANDONED? Besides all the above, there was the question of whether the Supervisors should be signing contracts before there was a single penny in funding from either the property tax increase or selloff of the old courthouse land. This became an issue when the architects showed up three months after the contract and requested a partial payment to cover their expenses. The Board said it could not pay them anything at all - and conceded there was a chance the courthouse might not even be built: "if the building was constructed the architects were to receive 5 per cent., and if it is not built, 2½ per cent." CAN WE ALL JUST GET ALONG? Not since the Civil War had Sonoma county been so torn apart by an issue. Although the Supervisors who were making all the decisions represented the entire county, it was clearly seen as a Petaluma vs. Santa Rosa battle. The Argus charged there was a Santa Rosa "Court House Ring" behind the push for the plaza courthouse; the Democrat saw the Petaluma petition as something like an extortion threat. Other towns apparently were wishing a plague on both their houses. Should the Petaluma vote get on the ballot, the Russian River Flag warned readers to vote against separation, and that Petaluma was just making a "cats-paw of Healdsburg and northern Sonoma, to rake Petaluma’s chestnuts out of the fire" (i. e. playing them for suckers). The Flag also claimed "there are dark hints about 'jobbery,'" (a fine old word for political graft) "which should be explained in full or all proceedings stopped." And that's how matters stood in the midsummer of 1883. Probably everyone in the county had strong opinions concerning not only the courthouse and the petition and actions by the Supervisors, but all the deceptions and machinations - and before it was all over, Santa Rosa would be divided as well. Some of these wounds would be salved over by the time the cornerstone was laid about a year later, but before then it would get even worse. And that expensive new courthouse would soon prove to be as much of a white elephant as the rickety building it replaced. * Thomas L. Thompson was elected California Secretary of State in November, 1882 and moved to Sacramento until he stepped down in 1886. He remained on the masthead as manager of both newspapers, but they were edited and published by veteran journalist John F. Linthicum. There was an informal discussion before the Board of Supervisors on Saturday of exceeding interest to the people of Santa Rosa. As soon as the pressing business of the Board was over the newly elected Supervisor, from this district, Mr. T. J. Proctor, brought up for the purpose of getting an expression of opinion from his colleagues, the matter of the building of a new Court House. He stated briefly, but forcibly, the necessity for action in this matter at once. There could he said, be no difference of opinion as to the necessity of a new Court House; that was admitted by all. Laying aside the unsightly appearance and inadequacy of the Court House to the increasing business of the county, there was necessity for a new building to protect the records which were liable to destruction at any time from fire, having more than once narrowly escaped that calamity. Judge Morse, the Chairmen of the Board, thought that there was a necessity for a new Court House. Supervisor Allen took the floor and expressed his views at some length. He said, in substance, he would favor the project if the building could be erected on a portion of the plaza. He said that, if a new Court House was built on the plaza, the present county property could be sold for a good price and that the Hall of Records would be close at hand and would be as useful to the county as it now is. If the Court House was removed from near its present site, it would necessitate the abandonment of that structure and would greatly depreciate its value and the value of the property on which the present Court House stands, which would, of course, have to be placed on the market. His idea, if it was correctly understood by your reporter, seemed to be to build on the north-easterly half of the Plaza, leaving the south-westerly half for a Plaza or grounds which would be useful and ornamental. Mr. Proctor expressed no opinion on the question of location of the building, but reiterated his formerly expressed views of the necessity for a new building, and his desire that the matter be at once considered. There was then a general discussion on the probable cost of a new Court House and the best means of paying for its construction, if determined on. Mr. Proctor stated that he would bring the matter before the Board at the next meeting, when he hoped some definite action would be taken. From the above it will be seen that the matter of a new Court House is now a live issue and it stands our citizens in hand to supplement Supervisor Proctor in every way in their power. An active, intelligent and immediate co-operation with him is of vital importance. The New Court House Proposition. Editor Democrat: I see in your paper of yesterday, under the head "New Court House,” an article in which it seems to be generally conceded by the Honorable Board, that the County is much needing a new building, a fact which is apparent to everybody. One of the members expressed himself ready to build, provided the City would give up a portion of the Plaza for a building site. Now, Mr. Editor, I don't think that the member meant what he said. If so, the remark was evidently made without first having duly considered it. Santa Rosa has no more interest in the question of a "New Court House,” than Petaluma. Healdsburg, or any other part of the county. Then why ask Santa Rosa to donate that which is the pride of our City? and should our City obtain that size [sic] which it bids fair to in the next decade of years, it will be of more advantage than the County buildings. There seems to be an economic view also taken by the Board. They say they can sell the present location for a good figure. I would ask the Honorable Board who made the present location valuable? The people of this city who have spent their hundreds of thousands, while the County has not so much as placed a decent sidewalk in front of its property; and now comes the cool proposition: "If we will give them part of our Plaza, the pride of our City, they will sell the land that was given to the County and build a new building.” I wonder if they will give us a guarantee not to sell the other after the city has built up and made it more valuable? Mr. Editor, permit me to say that if there is never a new building for the County until it is placed on the public Plaza, by the consent of the citizens of Santa Rosa, I doubt if many of the present generation lives to see the long wished for new building. The local press, we are glad to observe, is unanimously in favor of the erection of a new Court House. The Flag says, "Serious attention seems about to be given by the Supervisors to the subject of a new Court House. In the Flag's humble opinion the present structure is unsafe and unsightly. It should be demolished and a pile erected suitable to so prosperous and so great a county as this — a county of the first class." The Courier heartily endorses the proposition to build, but thinks the new structure should be located in the public plaza. Our neighbor does not understand the situation. However much the City Trustees might desire to donate the plaza for that purpose, it could not be done. The plaza was deeded to the people of Sonoma county for a public plaza, the northerly half by F. G. Hahman and ----- Hahman; and the southerly half by Julio Carrillo. Julio Carrillo afterward sold his half to some one else, claiming that he never delivered the deed to it, that it was surreptitiously obtained and placed on record, and the party to whom he sold has not abandoned his claim. We are also informed that Mr. Hahman will not consent to the use of the part deeded by him for any other purpose than a public square. The title to the plaza is, in short, in a complete tangle, and it would be folly for the county to think of erecting a building there, for it would simply be an invitation for half a dozen law suits. The agitation of the question of building a new Court House, by the Board of Supervisors, on Monday, has been the general topic of conversation since the facts were made known through the columns of the Democrat. The necessity of a new building is conceded by every one. On this subject there is no diversity of opinion, but the proposition to appropriate a part of the public Plaza as a site for it, does not meet with favor. A correspondent in this issue of the Democrat discusses the proposition quite fully, and perhaps at greater length than would be necessary but for the fact that it is best to have a clear understanding at the outset. The proposition emanated from a single Supervisor, and he had evidently given the subject a very superficial examination. The project is impracticable. The Plaza was set apart and given the city for the purpose to which it is applied at present, and neither the city, if so inclined, can authorize its use for another purpose, nor can the county appropriate it. But fortunately the county has ample ground, very desirably located, for all requisite purposes, — ground given it for that specific purpose if we are not mistaken. If this be true, is it not doubtful whether the county could sell it, or use it for any other purpose? But since there is so general an agreement as to the necessity of a new Court House, our citizens should do everything in their power to sustain our Supervisor in pushing the matter to a successful issue. There ought not to be any opposition to the measure from any source, and it is possible that there will be none except as to details. At the meeting of the Board of Supervisors today (Tuesday) a communication was received and read from prominent citizens of Petaluma, offering to donate their city plaza, valued at $50,000, together with the sum of $100,000 in cash, to the county on condition of the Court House being removed thither. A long list of subscribers to the $100,000 fund was read, the various amounts aggregating the sum mentioned. On motion of Supervisor Allen the communication was ordered received and placed on file. The New Court House Question. How about that unsightly, rickety old tumble-down concern called a Court House at Santa Rosa. The people are getting tired of looking at it, and besides that, it is considered unsafe! Let's have a new one. Why has this agitation ceased? ...In view of the necessity of steps being taken by the Honorable Board of Supervisors soon for the erection of suitable public buildings for the county of Sonoma and a location for its erection being the first thing in order, it is hereby resolved by the Honorable Board of Councilmen of the City of Santa Rosa, that the public Plaza of said city of Santa Rosa, or any other place they may choose to select in the city of Santa Rosa, be, and the same is, hereby tendered to said County of Sonoma for the purpose of erecting thereon suitable public buildings for said County of Sonoma. THE PLAZA FOR THE COURTHOUSE. The City Council, at its meeting Tuesday evening, adopted a resolution tendering to the County the use of the public plaza as a site for a new Court House, or any other place that the Board of Supervisors may choose to select. This tender of “any other place,” we presume, means any place over which the city has control, as it cannot present to the county the property of private citizens without their co-operation. In considering the question of location, there has been some clashing of private interests. Every owner of real estate is quite naturally alive to the importance of enhancing the value of his property. No doubt, there are citizens who would be glad to sell their property to the county at a good figure; others would be glad to have the Court House near, while perhaps others would be willing to donate sufficient ground with the expectation that the increased value of other property would repay them. This is selfish, it is true, but it is selfishness that moves the world and paves the way to Heaven. It becomes a fault only when it opposes itself unreasonably to the public welfare, and we trust there is no citizen of Santa Rosa who would allow himself to become amenable to a charge of that kind. The agitation of the new Court House question has developed one fact, we think, pretty clearly, and that is that the plaza is the only place for a site upon which there can be anything like a substantial agreement. The Board of Supervisors, we are informed desire to make that the location. The people outside of the town seem to want it there, and apart from some interested real estate owners, the people of the city appear to be favorable to it. If the selection of a site were left to those who want it elsewhere, they could not agree. One would be in favor of this location and another of that, and hence we believe to locate the Court House in the plaza would give more general satisfaction to that class even than if put somewhere else. In view of all the circumstances, therefore, we believe the City Council has acted wisely in tendering to the county the use of the plaza, and, after all that has been said, we do not believe the objections to it are as serious as some of our citizens have been inclined to believe. There is a little army of capitalists in our neighboring town of Petaluma, that are bent on having a Court House. Nothing will satisfy their cravings but a new Court House with an iron dog on the step and a weather sign on top. They sign any subscription that comes along and in amount of hundreds of thousands if necessary. They hold a full hand and would sooner bet on a new Court House coming to Petaluma than on four aces. They will subscribe any amount, sign any petition, and smile a Santa Rosa man out of his boots. Now that this fuss and flurry is going on, it is just as well to say right here that the people of Sonoma county will never vote to place the county seat in an off corner of the county, and outside of the immediate vicinity of Petaluma, nobody wants it there. The people of Petaluma propose to pay tor the new buildings necessary. This is a bribe offered the voters as an inducement to make them vote the county seat from Santa Rosa to Petaluma. If an election were held, and two-thirds of the people should vote to change the county seat on this proposition the election would be null and void on the grounds of this offer. This is against public policy. The Courts have decided this question. The result is that Petaluma can never get the county seat - no matter how much they offer. Another agreement proposed is to divide the county, giving Healdsburg also a Court House. Now it is just as well to say that dividing the county is simply out of the question. It can't be done. There is no law provided for it. Then there is the bonded debt that would have to be apportioned, the records would have to be transcribed anew — one set going to one county and the other to the other. A thousand other difficulties will arise. There is no machinery of law to carry out the details; so the best thing for the people of Sonoma county to do is to set down on this changing the county seat business. For some years it has been well known that the present Court House building was not adequate to the business demands of a rapidly increasing population, and still more rapidly multiplying Court records. Greater safety is demanded, especially for the records of the former Probate Court and its successor, the probate department of the Superior Court which form a link in the chain of title to almost every piece of property in the county. It cannot be denied that these important records, and others scarcely less so, are in a very exposed condition. In case of a fire in or near the Court House their loss would be almost certain. In view of these facts and the successive recommendations of several grand juries, the subject of a new Court House was brought before the Board of Supervisors. Santa Rosa, as a city, was not especially interested in bringing up the question. It came about in furtherance of the often expressed wishes of citizens from all parts of the county. When the matter was brought up the people of this city very naturally took interest in it and endeavored, by all means in their power, to conform to the wishes of the Board of Supervisors who represent the people at large. The City Council and our citizens generally considered that the members of the Board were unbiased judges of the question of location and in that spirit offered any building site the Board might select, without regard to their own views or wishes. The matter was brought up informally before the Board and a general expression of opinion was made by the members, each one expressing himself in favor of building a new Court House in Santa Rosa provided the city would donate for that purpose the public plaza. Supervisor Allen, of Petaluma, committing himself as fully to this as any other member of the Board. This took place at the February term of the Board. The Mayor of Santa Rosa, J. P. Clark, was present at the time of this expression of opinion, and said in effect that he would at once take steps to convene the Council, and that he would do what he could to satisfy the expressed wish of the Board, and would give them a definite answer as soon as he could get it from his colleagues. With this understanding the matter was laid over until the March meeting. At that meeting Mayor Clark appeared before the Board with the written consent of the City Council giving by unanimous vote all right, title and interest the city might have to the plaza for the erection of the proposed building. Supervisor Allen, notwithstanding his public declaration that he only asked the city to surrender her title to the plaza, made, as Mayor Clark and others supposed, in good faith and carried out on the part of the city in good faith, at once introduced a series of dilatory and evasive motions, one of which was that a day should be set at the April meeting of the Board when the citizens of Petaluma could be heard on a proposition which they had made to donate their plaza and a certain sum of money to build a Court House in that city. This motion was an idle one as the Board had no power to build a Court House any where else than at the county seat, no matter what sum was contributed, and it was simply a waste of time and money to set down for hearing by the Board a matter over which it had no jurisdiction. A county seat can only be changed by a two thirds vote of all the voters of the county, and until so removed, to entertain a proposition of building a Court House elsewhere than at the County seat is a legislative absurdity. The motion of the Supervisor from Petaluma accomplished its object, not, however, without a sacrifice of honesty of purpose in the minds of all candid persons who heard his open and unsolicited declaration at the February meeting of the Board. The hidden object of the Supervisor was delay, that a petition might be circulated calling for a vote on a removal of the county seat to the town that gentleman represents Petaluma. The petition has been circulated and runners sent out over the county to build up a prejudice against Santa Rosa, with a promise at the extreme ends of the county of its ultimate division and two county seats and two sets of county officers, which means double taxation and more debt. In this equivocal manner the scheme for a division of the county was set afloat, it started with bad faith on the part of its originators and it will end in their entire confusion. In the local jealousy, if such exists, between Petaluma and Santa Rosa, the people of the county at large have no part or parcel. If one populous county with a greater subdivision of the expense of government is better than two small ones with increased taxation, they will, of course decide in favor of one county, and no sophistical reasoning can induce them to do otherwise, whether they vote on the proposition next week, next month or next year, or in the next five years. So far as this city is concerned it has the friendliest feelings toward Petaluma. For our part we are proud of its growth and prosperity. As for Santa Rosa, we have no fear of its future. In 1870 it was an insignificant village of less than 900 inhabitants; in 1880 it had nearly 4,000 and at this time the number is nearer five than four thousand. It is the geographical center of the county, the agricultural and manufacturing center and its growth could not be impeded by the local jealousy of Petaluma, even if such a feeling existed. We are far from believing it does exist in a majority of the people of that city, but there are a few persons there who are never so happy as when they can make themselves conspicuous. To their love of notoriety is due the bringing up at this time of the question of a division of the county. A Santa Rosian [sic] who visited Petaluma last week on his return home reported to the Democrat that it would require a step-ladder to reach our court-house plaza. When the gentleman was here he tried to walk up the five steps from Main street to the plaza above the wall, but his legs were so infernally tired that he couldn't make the landing. He had been floundering around that sink hole in the center of his own town so long, that he couldn't appreciate an elevation of a few feet. PETALUMA AND HEALDSBURG TO BECOME COUNTY SEATS —WHOOP ! THE REQUISITE NUMBER OF SIGNATURES SURE TO BE OBTAINED. "There is not much doubt but that a petition with the requisite number of names for the submission of the County-Seat question to the people will be presented to the Board of Supervisors." With regard to the necessary cost of a court-house, it is seated that the imposing structure at San Rafael a building in every way suitable to the purpose, cost but $75,000; and referring to the expenses of fitting up new county-seats, the Courier has the following: Petaluma will donate her plaza, and furthermore offers $150,000 besides, which will build a magnificent court house, combining a splendid jail, hall of records and all the offices complete. And Petaluma will do more, and in order to comprehend every possible expense, will defray her part of the few thousands of dollars it will cost to copy the records. And Healdsburg proposes and will do the same...Each distinct county government could actually be run cheaper than half the total cost annually of the present county government: and it can be demonstrated by comparison with a dozen other counties in the State — some smaller and others less compact, and all having smaller population than either of the two proposed counties, many of which were blessed with a smaller tax rate than Sonoma last year. Just think of it! Healdsburg to become a county-seat. What shall we call the new counties? Where shall we locate all the lawyers’ offices? The Bank of Healdsburg building will have to be run up another story or two and a patent Hinckley elevator put in. We presume we shall have to run the Flag building up some and put in a steam elevator, and steam engine and presses, at the same time. The court-house must have four fronts, you know, because the four sides of the plaza, all filled with beautiful stores, will demand it: one front must face our way, sure. Won’t the building look fine, with a dome like the State Capitol, and the stars and stripes floating from the loftiest pinnacle; of course! After all, perhaps we’d better let Petaluma have the county seat. A gentleman who claims to know states that the Sheriff’s records prove that more criminals come from our southern neighbor than any other three towns in the county. They all have to be transported here at the public expense, and it would perhaps be cheaper to move the Court House and jail thither. Then there wouldn’t be such a decrease in Petaluma’s population every time the court meets. THE DIVISION. - It is only a question of time when the county of Sonoma will be divided. It would be cheaper to divide it now while we can get a new Court House in each county without cost to the tax-payers. The city of Santa Rosa has very generously offered to donate her fine plaza to the county if the Supervisors will erect a suitable Court House thereon. We are informed by Major James Singley, of this city, that the plaza already belonged to the county, and that he was present when Julio Carrillo donated it to the county. The city of Santa Rosa has been taking care of the plaza for some years past, and has taken good care of it, too, for it is one of the finest little parks in the county. We have also heard it stated, on what we consider reliable authority, that when the plaza was donated by the successors in interest of Mr. Carrillo, it was done with the understanding that it was to be used as a public plaza, or park, and not for any other purpose. In view of this, would it not be well for the Supervisors to ascertain to a certainty about the title before they expend the first installment of $80,000. The claimants to the plaza would, as a matter of course, remain very quiet while a big, fine building was going up on their property - or, in other words, upon property they claim will revert to them when used for any purpose other than that of a plaza. Of course, we very much desire to have the Court House down here, but if we can't get it Santa Rosa will do pretty well, but we protest against building even an $80,000 house on somebody's land, who will want it just as soon as the last coat of paint is put on. Petaluma is making the county-seat question hotter than ever. It says the recent action of the Board in ordering a new Court House had no force whatever, and that at the next meeting the requisite number of names will be had and a petition presented, praying the Board to grant an election for selection of site for the Court-House, which it will he bound to respect. In and about Healdsburg the petition is being generally signed, and the protest from Santa Rosa, in the hands of solicitors, is a failure. We do not know of their obtaining a single signature. The protest we saw certainly had none upon it, although the solicitor had been around some time. We have one word of advice to offer, and it is this; Before our people finally vote for division, let them be certain that Healdsburg will become the county-seat of the new county. The present agitation is a perfectly selfish one in all respects, and unless Healdsburg and northern Sonoma can be benefitted by it, we urge every voter to emphatically set down on all efforts to involve us all in the interminable confusion, in general, and entire wreckage of Santa Rosa in particular, to follow the removal of the county-seat to Petaluma. Thus far, the whole aspect of the affair seems to be to make a cats-paw of Healdsburg and northern Sonoma, to rake Petaluma’s chestnuts out of the fire; and unless our leading citizens organize and take steps to direct public sentiment aright, we advise here and now, that when the matter comes to a vote, the removal matter be absolutely and unanimously sat down upon. We have had our fun and put forth our chaff in this matter heretofore, but now that it is assuming a serious aspect, we venture this paragraph of warning. Mo and our Samantha went to Petalumar in sarch of the keounty-seat. When we drove down thru Healdsburg we stopped at the post orifice, wich is tended by Jurdan, to ask the way. He’s a shinin lite and a very Sivil Sarvice Reformer. He reformed Wright out of his plais, and is actin’ as a finger bored pintin’ to Washinton and Petalumar. Suckses to Jurdan and Reform — as long as he stays reformed. By’m by we jolted along over the stones so we culd see part way down Mane street, to the first crook. There wuz several tomb stone shops on each side, and a cheerful view of the salt mash to be seen in the near future. Perceeding along karefuly we found Mane street the wust piece of road on the jurney. Big bowlders clogged it and the ground was sidelin and sticky as if Natur had spewed up the town site sumtime when mity sick at the stumick, and then tried to hide it by scratchin a litter of houses on it. Skudder, Dinwiddie & Co., and all the real estate benefactors an’ offis hunters stood round, expectant like, on the korners wearin’ a be9 smile of welkum. For it is the day of small things. ...B. McDougall & Son presented one of the general plans of those preceding, with two stories and a basement. Sheriff’s office, cells and apartments for various purposes in the basement...Kenitzer & Raum next presented their plan...T. D. Newsom presented a plan of the Court House at Oakland on a smaller scale. He placed the Sheriff's office and jail on the basement floor and proposed to heat the entire building by steam. Had plans for an elevator in the rear for the purpose of conveying prisoners to the court room in such a manner as to preclude the possibility of escape...S. and J. C. Newsom presented plans... Messrs. Newsom & Gash presented their plan next. It provides for a passage way on a level with the ground all the way through the basement, and for a floor two feet in height on either side. The basement story is provided with cells and the Sheriff’s office, and is very completely divided off into apartments for females, insane persons, etc...Wm. Patton was the last architect that presented a plan at this session...Messrs. Bennett & Curtis having shipped their plans by express, and they having failed to come to hand, the Board decided to defer the further consideration of this matter until to-morrow morning. On Wednesday morning the gavel of the chairman fell at 9:20. The Supervisors’ room presented the appearance of a cross between a school of design and an art gallery. On every available space on the walls the competing architects had spread their designs, plans, outlines, in pencil, ink, or in crayon, in frames, without frames, and the atmosphere was filled with a confused sound of “outline," "cell-rooms,” “designs." A number of well executed outlines in frames hung back of chairman's desk, and from the criticisms we heard, our citizens have developed intb art and architectural critics of no mean talent. Messrs. Bennett & Curtis of San Francisco, presented a set of elaborate plans, and explained them fully. Like all those that proceeded it, it is for two stories and a basement, and differs from some others in the fact that the Surveyor’s, Treasurer’s and Sheriff’s offices are all in the basement. Supervisors’ room, the offices of the Assessor, Clerk, District Attorney, School Superintendent and the Judges’ chambers on the second floor, third floor is occupied by the two Court rooms, one of which is 87x57 and the other 33x39, the jury rooms and the Hall of Records, The length of building is about 100 feet. The designs all being in, Supervisor Allen suggested that the best plan to pursue would be to select a committee of disinterested persons and in conference decide upon the merits of the plans. That considerable had been said in relation to the opposition s»f the section that he represented to the erection of a Court House here, but that this feeling woald not affect the action of the Board at all, and that the plan or some plan would be adopted, that the location of the Court House was an after consideration but that a plan that would be a credit to the county wherever erected should be selected, and that to do this the Board should not act hastily but select only after mature deliberation. Mr. Proctor thought that the idea of having a conference committee an excellent ene, and thought that they could select the plan before to-morrow night. ... Mr. Morse responded, in other words to get some one outside the county to tell us what we want. Mr. Houser said the people had sufficient confidence in the seven men constituting the Board to allow them to decide this question, and that the architects could explain the plans better than anyone else. Mr. Proctor would just as lief take the architects statements as anyones, let them come in one at a time and explain their designs. Mr. Houser felt the same about the matter. Mr. Allen thought that to bar the architects from explaining would be an unjust discrimination. After a little more informal discussion, Mr. Proctor moved that at 1PM they commence with the architects as they did before and let them come in in the same order and each one fully explain his plan. Col. A. A. Bennett, the senior member of the successful firm, has resided on this coast since 1849, and has always held a prominent place in his profession, and has drawn the plans for, and superintended the erection of a large number of public buildings. Among them are the following court houses: Woodland, Yolo county, Modesto, Stanislaus county, Merced City, Merced county, Fresno, Fresno county, Bakersfield, Kern county, Visalia, Tulare county. He superintended the work and drew the plans when the old State Capitol building at Sacramento was changed into the County court house, planned and superintended the changes made in the Tehama county court house at Red Bluff; was associate architect at the time the present State Capitol building was erected at Sacramento; drew the plans for the proposed Governor’s mansion, which is now used as the State Printing office; the plans of the Golden Eagle, Capitol, Arcade and International Hotels at Sacramento were executed by him; the Mechanics Art College at Berkeley, the workshops and iron cells at San Quentin were also planned by him, and be also superintended the completion of the Folsom prison, making numerous changes and alterations in the original plans. Parties here, knowing something of architecture, make serious objections to the plan adopted by the Board of Supervisors for the new Court House. It is entirely too small for the purposes of a large county like Sonoma, and rooms for the different departments are not conveniently located for the public’s use. Notwithstanding the fact that our petition for a vote on the county seat relocation subject still circulates with a fair prospect of soon having upon it more than a majority of the electors of the county. Our citizens feel an interest in the new Court House wherever it is located and don't want a bad or unsatisfactory job made of it. Seventy-five or eighty thousand dollars will not be sufficient to construct a building suitable for the wants of this county. It will take a hundred thousand dollars at least. The offer of the people of Petaluma was to put up a hundred-thousand-dollar building and they will do it if it will bring the county seat here. Santa Rosa will be largely benefited by retaining the county seat and under the circumstances should do something towards building the new capitol. They have offered as we understand, to give the plaza and pay $50,000 for the old Court House, the Hall of Records and the lots upon which they stand. Leading citizens here, with whom we have conversed, will oppose with energy any sale of the Hall of Records property. It is well adapted for the purposes intended, cost a large sum of money and is more convenient of access and roomy in every respect than any hall that could be set apart for record purposes in the new building. The old Court House property is worth from $25,000 to $35,000. If the citizens of Santa Rosa will guarantee to the county to take it at a fair figure, this added to seventy or eighty thousand dollars to be raised by taxation would, properly expended, be sufficient to construct a building worthy of the county. Our petition will be ready for presentation at the next meeting of the Board of Supervisors, and whatever the good people of Santa Rosa propose to do, if anything, had better be made known before that time. On motion of Mr. Ellis, in the matter of percentage to be allowed to the architects, Messrs. Curtis & Bennett, (whose plans for a Court House for Sonoma county have been adopted) it is now therefore the expression of this Board that they will not allow the architects as superintendent of construction of said building, if the same shall be constructed, a percentage greater than five per cent, on the cost of said building, and said percentage shall include the cost for plans and specifications and detail drawings necessary for the completion of said building. The Court House question has progressed as far as the examination of the specifications. There are dark hints about “jobbery” already in the matter, which should be explained in full or all proceedings stopped. The Petaluma petition is quiet.